We want you to know that a gift of any type, in any amount, can make an impact, and that we strive to be good stewards of your generosity. Our new Gift Giving Guide provides a clear and concise overview of the many ways you can support the ACBF now and in the future! A legacy gift is a lasting way to demonstrate pride in your profession and preserve the tradition of the Allegheny County Bar Foundation’s service to our community. When you make a legacy gift, you ensure that the mission you care so deeply about – promoting justice for all and improving the community through public service law-related programs – continues for generations to come. Remembering the ACBF in your will through a charitable bequest. Naming the ACBF as a beneficiary of or owner of a life insurance policy. Providing for the ACBF through a life income gift (charitable gift annuity, charitable remainder trust, charitable remainder annuity trust, charitable remainder unitrust, or lead trust, or similar planned gift agreement. Gifts to the Legacy Society will be included in the Endowment Fund unless otherwise designated by the donor. The Endowment Fund strengthens the organization’s financial reserves to support current programs while enabling the foundation to prepare for future needs. Because only the interest is used each year, a well-invested endowment can continue in perpetuity as it grows in value. Recognition of your generosity and the ability to memorialize loved ones through named gifts, if you wish. Invitations to attend special events and recognition programs. Satisfaction of knowing that you have ensured the stability and continuity of the ACBF’s tradition of service. The bequest is the most common form of planned giving. With a bequest, you may make provisions for the Allegheny County Bar Foundation in your will, designating either a dollar amount or a percentage of your estate. Bequests should be prepared and executed with your attorney’s assistance. I give, devise, and bequeath $_________ (or ____percent of the residue of my estate, or all the residue of my estate) to the Allegheny County Bar Foundation, 400 Koppers Building, 436 Seventh Avenue, Pittsburgh, PA 15219. Cash contributions may be made on a one time basis, in several payments, or on an annual basis over a pledge period. Appreciated stocks, bonds, closely-held stock in a family business, or other property may be given to the ACBF. The value of a gift of stock is determined by the average market value of the stock on the date the gift is made. To identify the best procedure for making a stock gift, contact your broker. 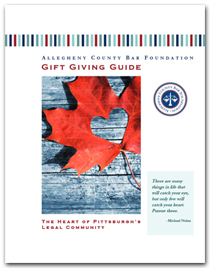 You may contribute gifts in-kind of materials, equipment or services to the Allegheny County Bar Foundation. A letter of transmittal, which specifies any requirements regarding use of the gift, should accompany gifts of property. Should you choose this kind of support for the ACBF, you will need to secure an independent appraisal of the value of your gift for tax purposes. Real Estate may provide a convenient way to support the ACBF. You may contribute real estate as an outright gift or deferred gift. For example, with a life estate agreement, a donor can make a gift of a home or farm while retaining life tenancy. Gifts of real estate should include a letter of transmittal with instruction for use of the gift. You may assign the ACBF as a beneficiary, co-beneficiary, or a secondary, remainder, or residual beneficiary of your life insurance policy. Annual dividends also may be assigned to the ACBF. When the ACBF is named as owner of a policy and/or the irrevocable beneficiary, the cash value of the policy may be deducted on your income tax return. The premiums paid thereafter also are deductible. The Charitable Gift Annuity is a simple contract between you, the donor(s) and the ACBF. Your tax deductible gift will be used to fund an annuity that will guarantee you lifetime income. This can be funded with either cash or securities. The IRA Charitable Rollover allows individuals age 70½ and older to make direct transfers totaling up to $100,000 per year to the ACBF, without having to count the transfers as income for federal income tax purposes. Also known as a charitable income trust, this is the converse of a charitable remainder trust. Whereas a remainder trust pays the income to non-charitable beneficiaries and then distributes the remainder to charity, a lead trust pays the income to charity and distributes the remainder to non-charitable beneficiaries. The charitable remainder annuity trust shares many features with the unitrust; the principal difference is the manner of calculating the payment to the income beneficiary. If you wish to guarantee a fixed dollar income each year, the annuity trust offers you that option. This amount must equal a sum of not less than five percent of the initial fair market value of the gift in trust. In most cases, you will wish to receive the income for your lifetime. You also may wish to provide for your spouse or other beneficiary. Eventually, the principal of the trust goes to the ACBF. No additional contribution may be made to an annuity trust, but you may establish more than one. The charitable remainder unitrust is a gift that pays you income for life and can also provide income for a successor beneficiary for life. It provides an immediate tax deduction and freedom from estate taxes. A charitable remainder unitrust provides for a fixed percentage of return of not less than five percent of the value of the trust’s assets valued annually. Because of that annual valuation, the payout to the donor will rise and fall with the economy. The rate of return is agreed upon at the time you establish the unitrust; however, the higher the rate of return, the smaller the charitable deduction. You may make additional contributions at any time. When the beneficial interest in the unitrust ends, the principal goes to the ACBF. The Allegheny County Bar Foundation recommends that you consult with a tax professional or attorney concerning your estate plans. If you are interested in creating a legacy with the ACBF, please contact Director Lorrie Albert at 412-402-6640 or lalbert@acba.org. If you have already made a provision to remember the ACBF through a planned gift, please let us know so we can appropriately recognize your generosity.